Today more than 3 million people are using cryptocurrencies like Bitcoin, according to a study by the Cambridge Center for Alternative Finance. But are cryptocurrencies the same as cash? Can they be taxed? States have started to wade into these complex waters, but only a few have enacted laws or issued concrete guidance on point. Unlike fiat currency, cryptocurrencies like Bitcoin only exist in digital form. Bitcoins are sent between users on the Bitcoin network, similar to a peer-to-peer file sharing network. These transactions are monitored by a decentralized network of computers using a common ledger. Bitcoin owners can also use to purchase goods like airlines tickets from Expedia, crafts from Etsy Inc., and goods from approximately 100 other retailers in the growing industry. And states are starting to weigh in on how to tax those payments. In 2018, 23 states and the District of Columbia introduced bills that deal with Bitcoin. New York and California have done the most in the emerging area with respect to taxation. Both have written guidelines on calculating sales tax when using Bitcoin for purchases. New York focuses on the value of the Bitcoin transferred to determine the sales tax base, not the list price of the good, Beaudro said. Bitcoin isn’t issued by a central bank or backed by a government. Monetary policies, inflation rates, and economic growth measurements that influence the value of a currency don’t apply to Bitcoin, which is seen as property under IRS guidelines. The list price of the goods and the value of the Bitcoin would be equal in a perfect world, Beaudro said. However, because the market value of Bitcoin is subject to volatility, this may not be true. 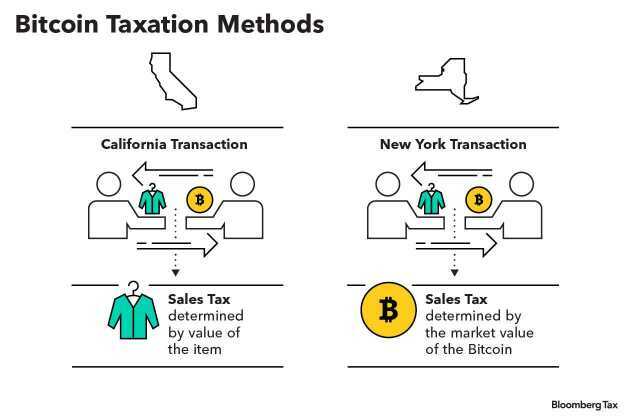 The seller must evaluate the value of Bitcoin at the time of the transaction when collecting sales tax under the New York model. This would mean that if a consumer purchased a taxable item listed at $50, with an amount of Bitcoin evaluated at $49.57, sales tax would likely be calculated on from the $49.57. “New York seems to be treating Bitcoin more like currency than property,” Wm. Gregory Turner, founder of Turner Law, told Bloomberg Tax. He cautioned that this method may be more complicated to utilize. That’s because with the fluctuating value of Bitcoin, sellers may need to constantly reevaluate the value of the Bitcoin, making the process harder, Beaudro said. However, this model also has benefits. Given that the New York method focuses on the value of the Bitcoin in exchange for a taxable item, this method could be considered to more closely tax the economic value transferred by the purchaser, he said. California’s model is the opposite of New York’s. California’s model calculates sales tax using the list price of a good, not the value on the Bitcoin, Beaudro said. So, if the consumer purchases a taxable good for $50, then the seller would be obligated to collect sales tax based on the $50 list price. The exact value of the Bitcoin isn’t taken into consideration, making this method more of a “ball park” method, Turner said. This method appears more straightforward to administer than New York’s because the fluctuating value of the Bitcoin likely wouldn’t affect the sales tax base, Beaudro said. The California model is more consistent with the IRS’s approach for federal tax purposes because it treats Bitcoin more like property, Turner said. Smaller states may be more willing to adopt this model because of its relative simplicity, Turner said. Other states have also begun looking at sales tax calculations on Bitcoin, Heather Morton, program principal in fiscal affairs at the National Conference of State Legislatures, told Bloomberg Tax in an email. Kentucky, Michigan, New Jersey, and Wisconsin have also issued notices explaining how the state’s sales and/or use tax will be applied in a transaction, Morton said. The majority of state Bitcoin legislation, however, deals with unclaimed property and money transmission laws. There are a small number of bills that would authorize state agencies to accept virtual currencies as payment, Morton said. However, in the latest legislative sessions, bills approving the use of Bitcoin for tax payments failed in Arizona, Georgia, and Illinois. The future of Bitcoin and sales tax depends on the popularity of virtual currency in the upcoming years, Beaudro said. Turner thinks the high risk and its classification as property and not currency make the future of Bitcoin even more uncertain.